For farms that are breeding and finishing, there’s a natural tension between groups of stock. On the one hand you want to get sale stock up to good weights and on the truck, and on the other hand you are preparing breeding replacements for good performance. North Canterbury farmers Duncan and Tina Mackintosh have looked closely at this balance on their farm. “We knew we could finish lambs well,” says Tina. But while their sale lambs achieved good liveweight gains after weaning, the replacement ewe lambs in Duncan’s words “flat-lined”. The sale lambs were getting the best feed, and as a result the ewe replacement lambs and adult ewes were not performing as well as they could. When adult ewes are light at tupping, this affects conception rates and then potentially every other aspect of their reproductive performance – lamb survival, ewe milk production, lamb growth rates and weaning date. At the Mackintosh’s weaning is now viewed as the start of the new reproductive cycle. 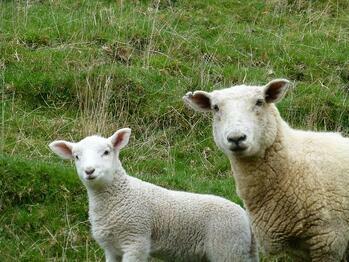 It’s when they first see their new lamb crop and can start to prepare them for their first mating. Also, a detailed plan has been laid out for monitoring their ewe replacements, with target weights and condition scores. They have worked out this could lift the value of their future lamb crops at weaning by $52,000. Want to find out more about the tool they’ve used for analysis and are now using for tracking progress?